Christmas deal: Free Samsung Galaxy smartphone with QLED TV purchase | What Hi-Fi? Samsung has had a stellar year in the TV department, with many of its 2018 QLED TVs bagging five-star status. So if you're after a new TV in time for Christmas, and your festively-decorated living room deserves one of high calibre, they wouldn't be a bad place to start - especially in light of Samsung's Christmas deal. Samsung is giving away either a free Note 9, S9+ or S9 smartphone with select QLED TV purchases between now and 18th December. The TV you buy depends on the phone you receive, and, yes, you have to spend a lot to get a lot. Buy a QE55Q8F (55in) or QE65Q8F (65in) and you get a free Galaxy S9. 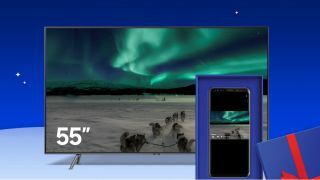 Buyers of a QE55Q8C, QE55Q8DN (55in, five-star), QE65Q8C or QE65Q8D TV can claim a free Galaxy S9+, while anyone stretching to Samsung’s flagship QE55Q9FN (55in, five-star), QE65Q9FN (65in, five-star) and QE75Q9F (75in) TVs can get their hands on the company’s most premium (and most excellent) smartphone, the Galaxy Note 9 - worth £600. The freebie smartphone deal applies to all TVs bought between the 5th December 2018 and 18th December 2018, and must be claimed within 30 days of the purchase date. To claim, you’ll need to upload a copy of the TV’s serial number and your invoice/receipt at Samsung’s website.